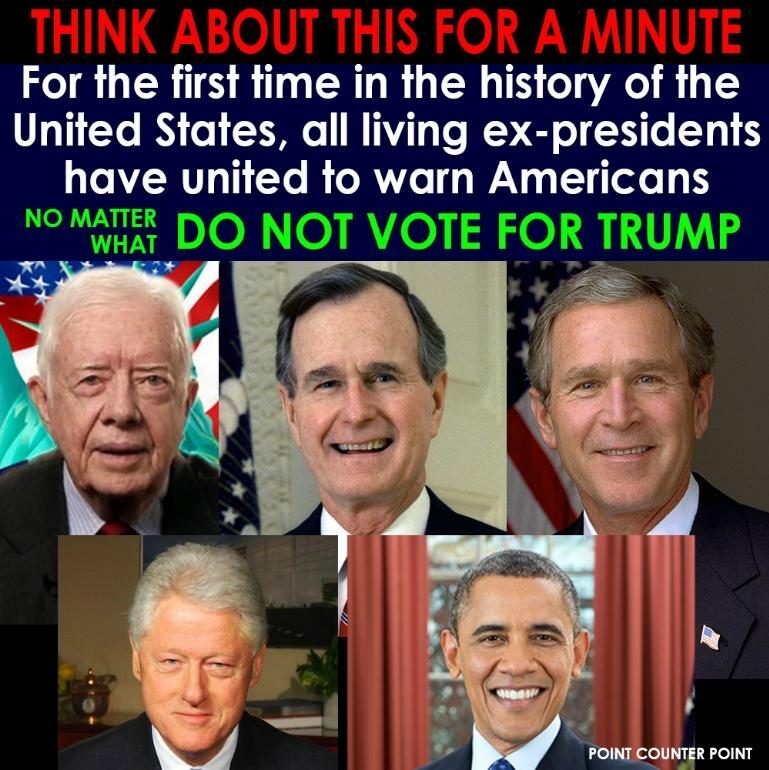 An image reporting that all living ex-presidents have warned Americans to not vote for Donald Trump is not quite accurate. All living former Presidents of the United States have urged Americans to not vote for Donald Trump. Former Democratic presidents Jimmy Carter and Bill Clinton, as well as current president Barack Obama, have endorsed Hillary Clinton and criticized Donald Trump. Although former Republican presidents George W. Bush and George H.W. Bush have not endorsed Donald Trump, neither have they have criticized him or warned Americans not to vote for him. Of course this circumstance (if true) would be something of a shallow precedent, given that the current campaign is Donald Trump’s first bid for public office, and therefore no ex-presidents would ever have had occasion to urge Americans not to vote for him before. Bush 41, who enthusiastically endorsed every Republican nominee for the past five election cycles, will stay out of the campaign process this time. He does not have plans to endorse presumptive GOP nominee Donald Trump, spokesman Jim McGrath [said]. “At age 91, President Bush is retired from politics,” McGrath wrote in an email. “He came out of retirement to do a few things for Jeb [Bush], but those were the exceptions that proved the rule.” His son Jeb Bush dropped out of the GOP presidential race in February . While the silence of former presidents from Trump’s own party — who normally would (and did) endorse previous Republican candidates — could be considered a tacit rejection (or even a stinging rebuke) of the current nominee, neither the elder nor the younger Bush has openly criticized Trump since he became the GOP nominee, much less warned Americans not to vote for him. Second-hand scuttlebutt has it, though, that the elder Bush confided in a family friend he would be voting for Hillary Clinton. The Huffington Post. 16 September 2016. Real Clear Politics. 26 July 2016. Texas Tribune. 4 May 2016.